November 1918, the guns on the Western Front fell silent ending the First World War, however the world was still at war. The ‘enemy’ didn’t need to use modern warfare to claim its victims, this enemy was the ‘Spanish Flu’, and it hit the young and healthy particularly hard. To date this was the worse pandemic that the world has ever seen since the Black Death. 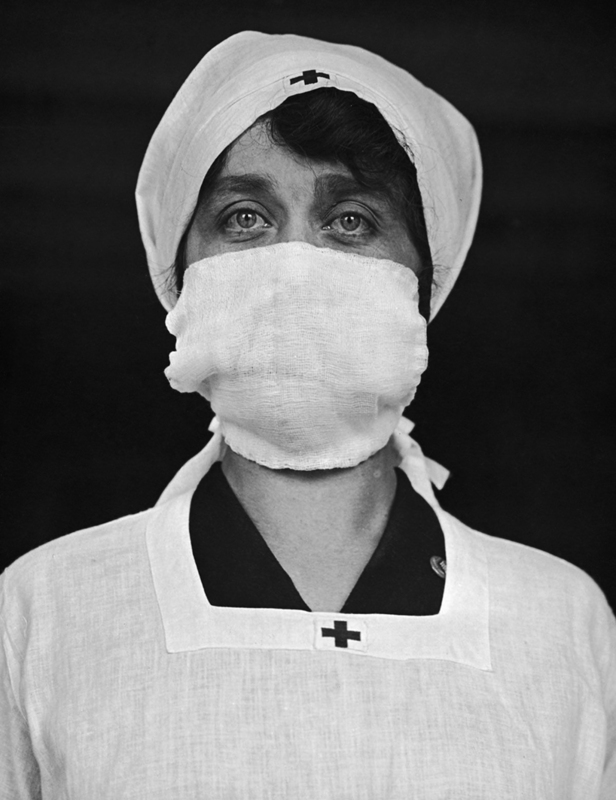 The origin of the Spanish Flu was of one of three locations. Firstly, it could have been established at a British army base at Etaples. Secondly, at Fort Riley, Kansas, USA, where a new Camp Funston, home to at least 50,000 serving soldiers, where the first case of flu was recorded in March 1918. Within hours of the first case, dozens more soldiers fell ill with the symptoms. By the end of the first week, there were at least 500 cases. Finally, it was thought that the outbreak actually started in 1917 in Shanxi Province, China, and that it was spread by the Chinese labourers who were hired to work in France and Britain during the First World War. Even today the origin remains a mystery. So why was it called the Spanish Flu? Spain who remained neutral during the First World War, and didn’t have the same wartime censorship, was able to report that King Alfonso XIII was gravely ill, but made a full recovery. 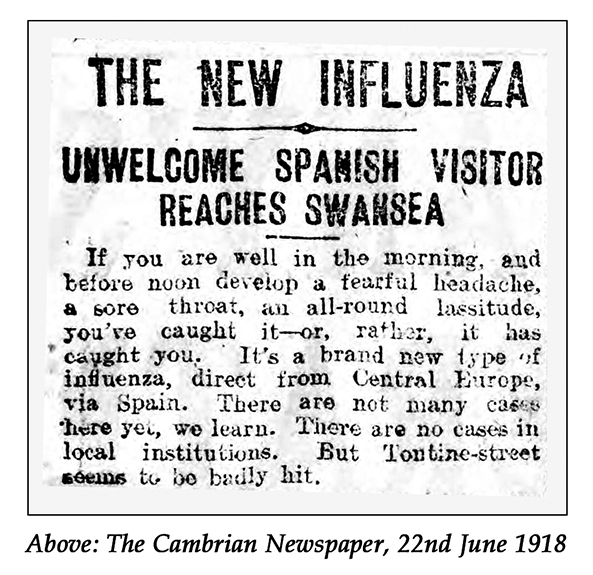 The newspapers of the day thought and reported that Spain was the most affected country, thus the pandemic was dubbed “the Spanish Flu”. Prime Minister David Lloyd George contracted it, and made a full recovery. Back in the UK, the flu easily spread with returning soldiers, who travelled home on the railways to various parts of the country. The main symptoms were sore throats, headaches and a loss of appetite. Usually, recovery was swift but with no treatment available, such as antibiotics or penicillin, the ensuing pneumonia was fatal. Penicillin was ‘discovered’ in 1928 by Alexander Fleming. 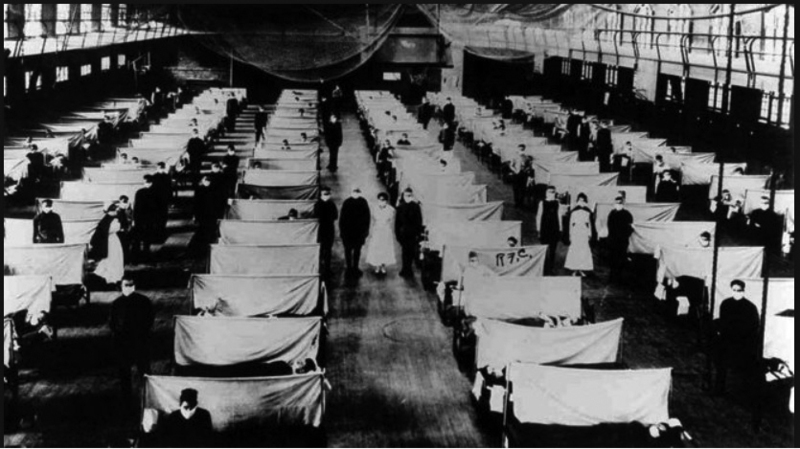 It is estimated that 228,000 British people died from the Spanish Flu. Here in Wales, that number was 11,000. How were these figures calculated? Each year, the Medical Officer of Health would produce a report and setting out the work done by his public health and sanitary officers. The reports would provide information such as birth and death rates, infant mortality, incidence of infectious and other diseases and the general health of the area. 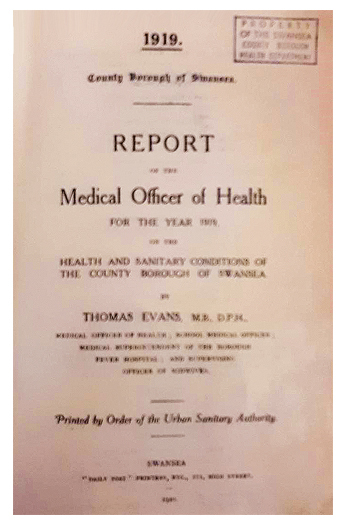 Using the 1918-1921 Medical Officer of Health Reports for Swansea, we can establish how many people died from Spanish flu. 1918 – 273 deaths; 1919 – 161 deaths; 1920 – 54 deaths and 1921 – 15 deaths. Two of those who died from the influenza and its complications in 1918 were father and daughter, Thomas (64) and Lydia Williams (25), of 66 Pentregethin Road. They died on the 27th and 28th November. Lydia had gained her certificate to be a school teacher (Elementary). Both were buried at Babell Cemetery, Car-marthen Road, on the same day, 30th November 1918 (see Burial Register above). The Medical Officer of Health Reports (left) can be found in the West Glamorgan Archive Service, Civic Centre.By the summer of 1919, the flu pandemic came to an end. Makeshift warehouse converted into a Hospital War, circa 1918. Credit BBC. Since my last article “Remembrance Never To Be Forgotten”, in the winter issue, I‘ve had two very interesting responses regarding Dead Man’s Pennies. Over the Christmas period, I went to Babell Cemetery, in Cwmbwrla to find some headstones and to see the problem that the Japanese knotweed was causing. Jo Mullett, who is working on eradicating the knotweed showed me around. Jo told me about her father, John Alfred Mullett, having the Dead Man’s Penny belonging to his uncle. 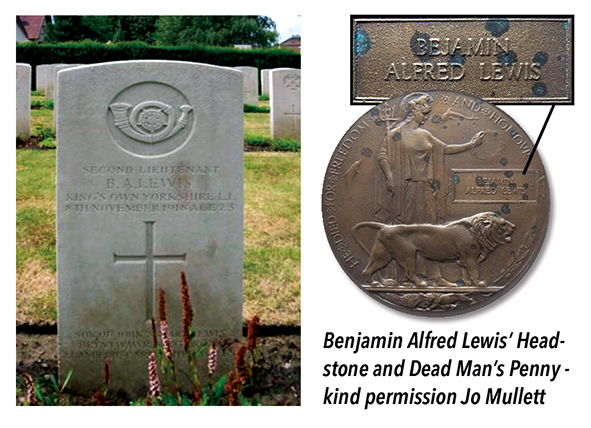 Second Lieutenant Benjamin Alfred Lewis, from Llandybie, Carmarthenshire served with the King’s Own Yorkshire Light Infantry. On 8th November 1918, whilst crossing the Sambre, Benjamin was killed, and is buried at Avesnes-sur-Helpe Communal Cemetery. I was also contacted by Mike Murphy who had seen my daily post on my Facebook page, with regard to his great grandfather, Private John Dalton. ‘Dalton’ wasn’t his name but Murphy. The story of John was told to Mike by his grandfather, Thomas. 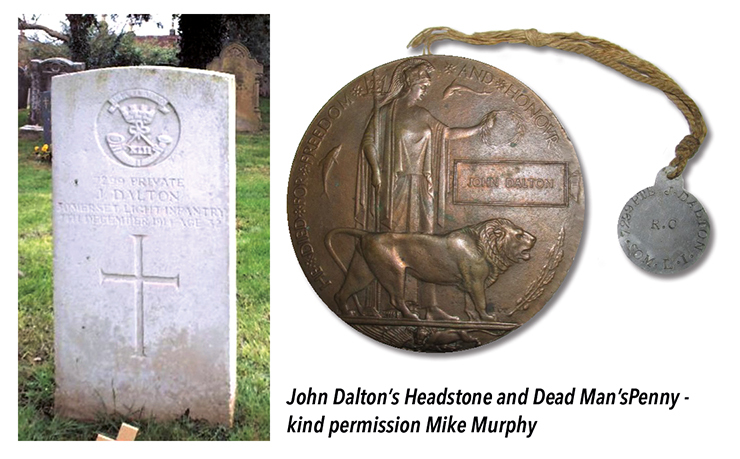 John Murphy had ‘adopted’ his grandmother’s maiden surname, Dalton, when he enlisted with the Somerset Light Infantry in 1904 aged 17. John’s parents, John and Druscilla Murphy lived at 5 Skinner Street, with Ann Dalton, the grandmother. During the early 1900s, the family moved to Methyr Tydfil, for work. John stayed behind with his grandmother. By 1907 John was out of the army, but in 1914 John re-enlisted at the outset of the First World War, again using the name of John Dalton. John was waved off from Swansea Railway Station, around 21 August 1914, by his wife Druscilla and sons, Jack 9, Thomas 9 and James 18 months. By December 1914, John who had seen action at Mons, was wounded and brought back home to the UK. He was sent to Lord Lucas’ Hospital, Wrest Park, Bed-fordshire, where he died from his wounds on 7 December 1914. He was the first to be buried at St. John Churchyard, Silsoe. August 2014, to mark the centenary anniversary of the outbreak of the First World War, Wrest Park held an event to commemorate Wrest being used as a hospital. Sadly, no photograph has survived of John Dalton. 2018 was a remarkable year for anniversaries and commemorations. 14 December 2018, marked the 100th anniversary of the first elections after the First World War, following the passing of the Representation of the People Act, February 1918. For the first time, women over the age of 30 and who owned a property could cast a vote. It was first announced on 14 November 1918 that the Parliament which had been sitting since 1910, would be dissolved on the 25th November and the elections were held on Saturday 14th December. The elections were known as the Khaki Elections. The Results were not counted until the 28th December, allowing for soldiers who were still on active service, to cast their votes. At the time of the election, the Prime Minister was David Lloyd George (right), the First and Only Welsh and Last Liberal Prime Minister. It is Lloyd George whilst Chancellor of the Exchequer (1908-15) who laid the foundations for the modern Welfare State, and helped the nation to win the First World War. 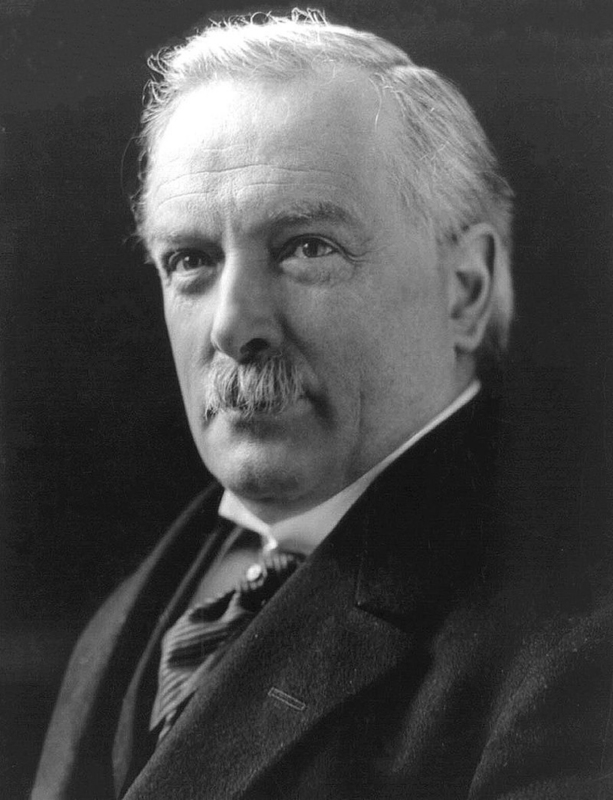 The outcome of the Election was a Coalition Victory, seeing Lloyd George remain as Prime Minister. Lloyd George is also warmly remembered in the simple folk song “Lloyd George knew my father/Father knew Lloyd George”. Meanwhile, in Swansea, the Liberal candidate, Alfred Mond kept his seat, which he gained in 1910. The number of the Registered Electors in Swansea West, in 1918, was 31,884, however only 21,487 turned out to vote. 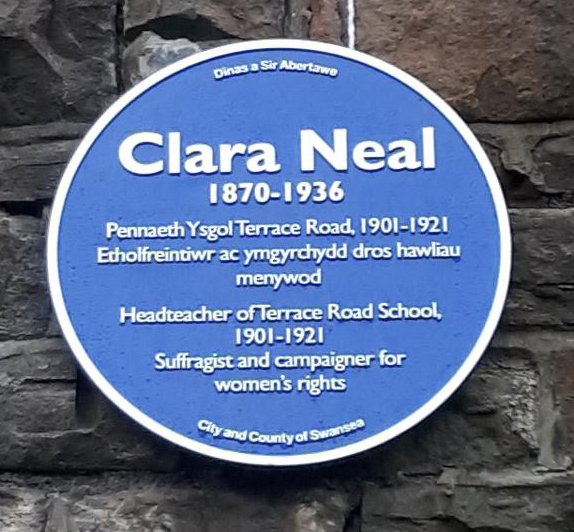 14th December 2018, also saw the unveiling, of another Blue Plaque (left), this one situated on the wall of Terrace Road School, commemorating Clara Neal. She was headmistress of the school from 1901-21. Along with her lifelong friend, Emily Phipps, she was involved with the suffrage movement, establishing the Swansea branch of Women’s Freedom League. Phipps was one of 17 women candidates who stood for the 1918 Elections. Sadly, there doesn’t seem to be a photograph of Clara that has survived.